Setting up the Communication Preferences is an important step to prevent alerts from cluttering different modules in your system, and to ensure you receive the alert exactly where you need it. 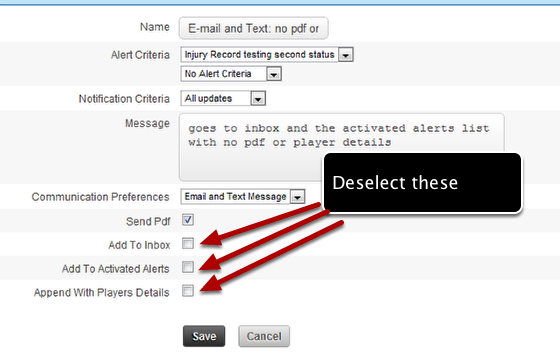 -You can also specify if you want the athlete's contact information to appear in the alert message. HOWEVER: IT IS IMPERATIVE THAT YOU ALWAYS CONSIDER THE MECHANISM WHICH YOU ARE SENDING THE INFORMATION AND WHETHER YOU HAVE KEPT AS MUCH OF THE INFORMATION SECURE AS POSSIBLE ACCORDING TO YOUR ORGANISATIONS NEEDS. Step 5: Setting the Communication Preferences- Select the preference for where the notification will be sent to for the users who are set as the notified user. Internal only: To the internal messaging system that is accessed through the account button with a pdf attachment of the entry and the player's contact information. E-mail: To the user's external mail address (the one saved in their account information) with a pdf attachment of the entry and it would include the player's contact information. Previously, all activated alerts also appeared in the Activated Alerts list on the Performance Alerts module and on the Athlete's History Page, and in the internal mail. Now these can be customised using the additional communication criteria (outline in the steps below). NOTE: Once an Email is sent from Smartabase, is it not encrypted, it is sent to the user's external mail address. #1: Send Pdf means a PDF attachment of the actual entry that triggered the alert will be included with the alert when it is sent via Emailor the internal mail system. If this contains senstive medical information, carefully consider whether you should be sending this as a pdf attachment via email. #2: Add to Inbox means the alert will appear in the inbox in the internal messaging system. #3: Add to Activated Alerts means the alert will appear in the activated alerts list. #4: Append With Player's Details enables you to have the alert sent with or without the player's information who the alert was triggered for (so you can contact them immediately if need be). As this might be deemed as senstive information, carefully consider whether you should be sending this, especially if it is used in inconjunction with other features like Email and PDF. Examples of each of these are outlined in the steps below. #1: If the "Send PDF" is ticked, the entry will appear as a PDF attachment in the inbox message (as shown here) and also in any external Emails (as shown in the image in the step below). #1 Send PDF: A PDF of the actual entry will be converted into a PDF attachment AND it will be sent and attached alongside the email. If the entry contains sensitive personal/medical information, carefully consider whether or not it should be included as an attachment. An example of an attachment of the Injury form. For example the image below shows that an Injury record alert was sent AND it contains the injury information entered for the form that is being set up to trigger the alert. Although the attachment can ONLY be sent to a user who has an email address in the Smartabase, and they must have access to the athlete and the form to receive the alert, follow any organisational guidelines on whether this information should be being sent out from Smartabase, or whether the user should login to Smartabase to see the actual content. No attachment is available if "Send PDF" is unticked during the alert set up. You can stop alerts cluttering you internal inbox message by unticking the Add to Inbox when you set up the alert. However, if you want the message to appear here then ensure the "Add to Inbox" is ticked. For most users, you only need the alert appearing in the Activated Alerts list if you are using it as a reference to track alerts overtime, or if you use this and not the e-mail, text or inbox as your main form of notification of an alert. You can disable the alerts from being sent her by unticking the "Add to Activated Alerts" tick box. #3: Activated Alerts ALSO appear above the athlete's records in the Athlete History Page. If the "Add to Activated Alerts" is ticked any alerts that are fired appear in the Performance Alerts Activated Alerts Page, as well as above the Athlete History for the athlete. If the "Add to Activated Alerts" is unticked, alerts will not appear in the activated alerts list OR in the Athlete History Page. Player's details can be set to appear to enable a user to contact the athlete if they needed to. If this is not ticked it will not display (as shown in the image in the step below) in the message (as shown in the image in the step below). If you work with your athlete's on a daily basis, or the contact information is not up to date, then ensure the Append with Players Details is not ticked. When you set up or update you alerts, think about how you best need them to work for you AND how to best protect your athlete's data. With this set up, you will receive a text and an Emailto you external Emailaccount. There will be a copy of the event that triggered the alert on the Emailas a pdf. However, no alerts will be sent to the inbox or the activated alerts list so these modules will not get cluttered. If you work with your athletes/players on a daily basis you will not need the Player's details to be included in the alert either. 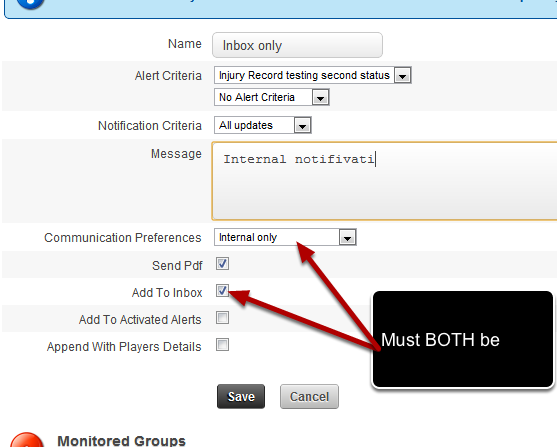 Click Save to set up the athletes who are monitored and the users who are notified of the alert.